For our last morning in the Czech Republic, we got up and attempted to grab some breakfast at our favorite bakery. Unfortunately, once we got off the tram, we found that the shop was closed on Sundays. We opted to grab two rolls and yogurt from a nearby grocery store and walked back to the apartment. We got back to our apartment a little after 9:30am and had to turn around and leave by 10:00am. A taxi picked us up and took us to the airport. 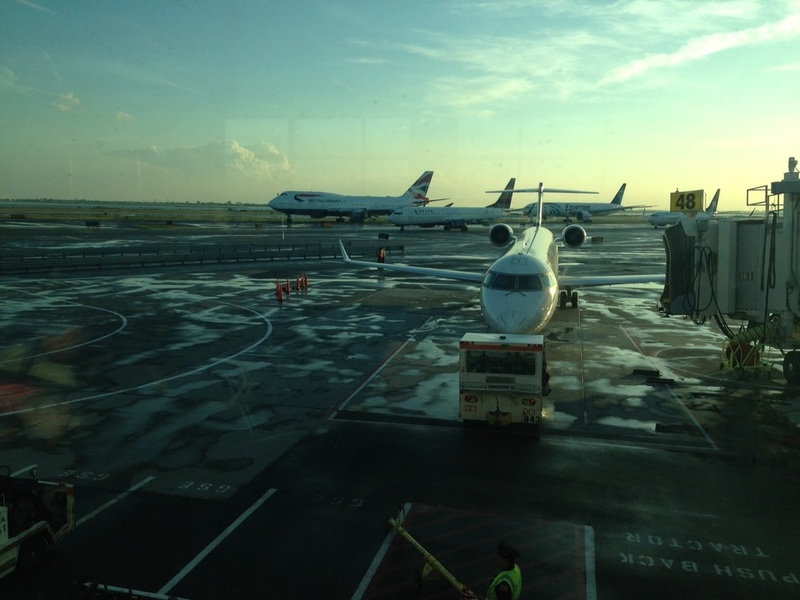 Our flight left around 12:30pm and we landed in New York around 3:30pm Eastern time. Now we're sitting at our gate, waiting for our delayed flight to Chicago. Hopefully we'll land before 11:00pm tonight. Since the trip is over, I want to thank everyone who made this trip possible, especially my awesome traveling partner, my mother! Thank you to everyone who I met along the way and all who have been so generous and hospitable to us. And finally, I'd like to thank everyone who kept up with the blog - thank you, readers! I look forward to sharing more adventures with you in the future! It was another relatively early morning today, and we stopped at the same small bakery as yesterday for breakfast (more koláče!). 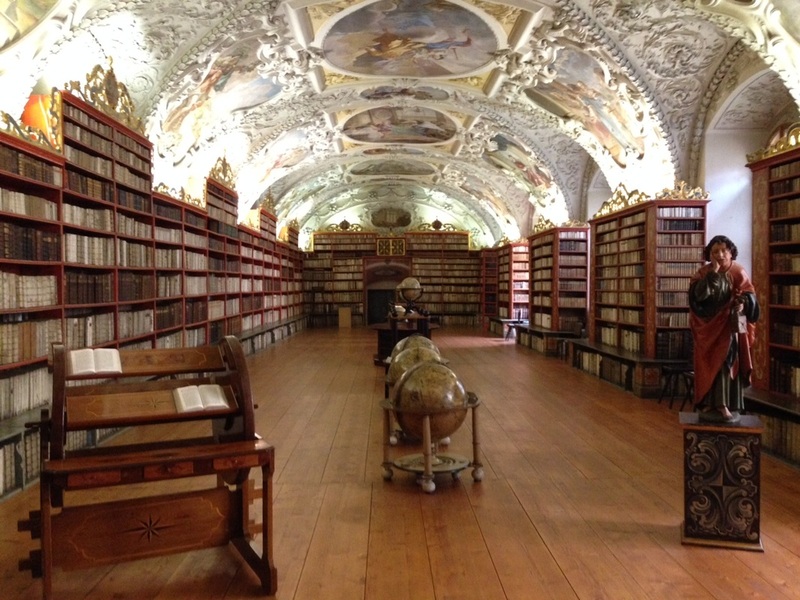 We then headed to the Strahov Library, an amazing building and collection that dates back over a thousand years. 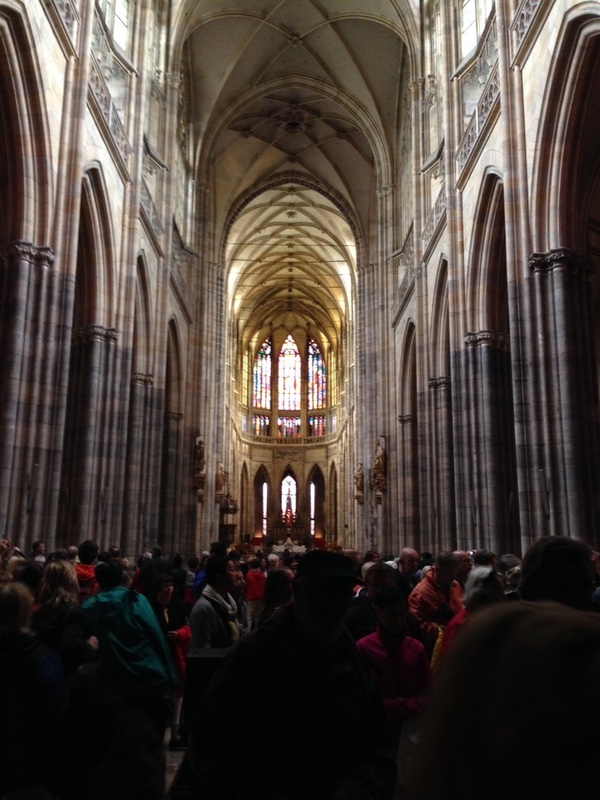 After the library, we went to the nearby Prague Castle and bought tickets for the day. 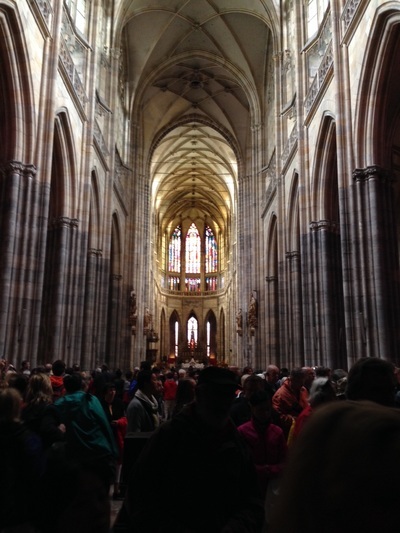 Our first stop within the castle's huge walls was St. Vitus Cathedral. Although construction on this tremendous church began in 1344, it was not fully completed until 1929. 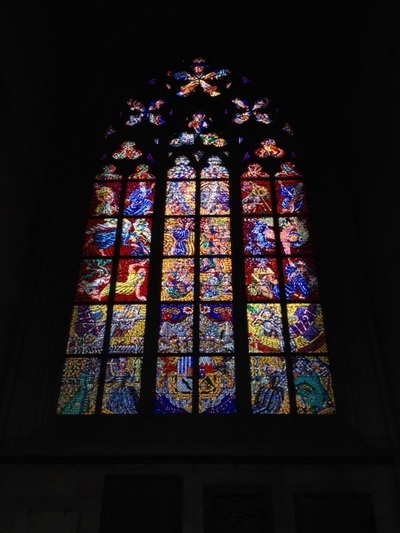 This cathedral is known for its exquisite stained glass windows and is also the final resting place of much of Czech royalty, including the famous St. "Good King" Wenceslaus. Once we left the cathedral, we walked over to the Old Royal Palace and toured a few of its rooms. This was the site of the famous Defenestration of 1618 that lead to the Thirty Years' War. Then, we walked to St. George's Basilica, a Romaneque church that dates back to the 10th century. It was around 11:00am by then, so we decided to tour the Lobkowicz Palace Museum which is also located within the castle walls. The Lobkowicz family has been known for centuries as an outstanding patron of the arts (encouraging the work of several painters, but more notably the music of Ludwig van Beethoven). The exhibition was fantastic and the audio guide tour (recorded by Prince Lobkowicz himself) was extremely informative. The Lobkowicz property and collection, spanning several centuries, was stripped from the family during the Nazi and Communist occupations of Czechoslovakia between 1939 and 1989. The family was finally allowed to return to Czechoslovakia in 1990 and reclaim their belongings after the end of the Communist regime. Although the collection contains many priceless works of art (such as Bruegel's Haymaking), more interestingly for me, it also contains several old instruments and original musical manuscripts. Among the treasures housed at the Lobkowicz Palace are the original scores of Beethoven's Fifth Symphony, his first six string quartets, Mozart's re-orchestration of Händel's Messiah, and various other important orchestral and operatic manuscripts by several different composers. 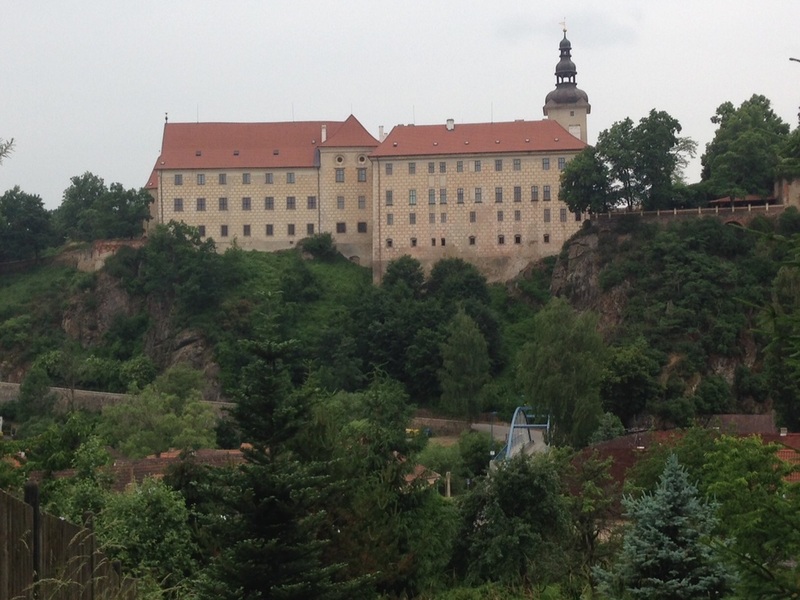 We had an excellent lunch in the Lobkowicz Palace Café and then left the castle. We took the tram to the other side of Prague to pick up a few more Beránek beers from the Beránek Hotel before returning to the northwest side of the city to visit Letná Part. Since it's situated on top of a hill overlooking Prague and the Vltava, it has some amazing views. From there, we took the tram back to our apartment and did some packing before turning back around and heading into Prague around 6:00 for dinner. 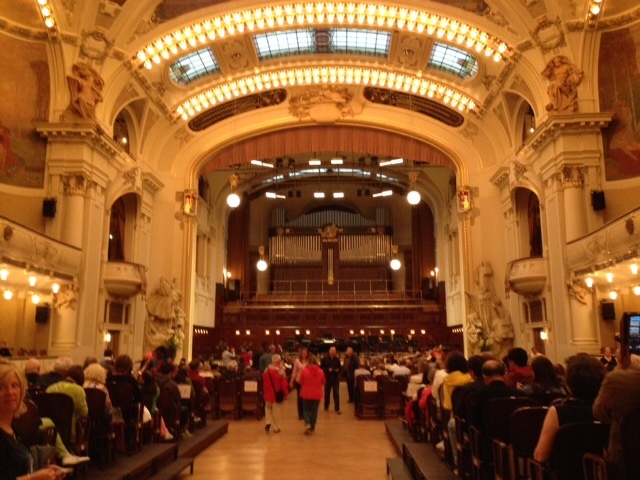 We ate at the beer hall in the basement of the Municipal House again (see Day 2), and saw a concert in Smetana Hall at 8:00. The program was Mendelssohn's Violin Concerto, Schumann's Piano Concerto, and Dvořák's Ninth Symphony "From the New World". It was a great way to spend our last night in the Czech Republic, even though the conductor (and therefore the timing in some areas) was not that great. We got home around 11:00pm, and now we're heading to bed to rest up for our long day of traveling tomorrow! Our flight leaves Prague around 12:30pm, but I'll hopefully give one last update before the trip is over. We left our apartment around 9:00 this morning and were hoping to get on the road quickly to drive out to Terezín. After stopping at a nearby bakery for some excellent koláče, our ridiculously incompetent GPS decided to direct us through Prague instead of out of it. The result was that we sat in traffic for one whole hour and successfully made it to the wrong side of the city. After finding the main expressway around 10:15am, we were finally on our way to North Bohemia. Then, we realized we were low on gas, and after filling up, we found out that our front tires were low on air, too. After getting off two more times at gas stations, we discovered that Czech gas stations don't seem to have areas to fill up your tires. So, we drove around the rest of the day with warning signals going off. Finally, we arrived in the town of Terezín at around 11:00am. It was cold and cloudy, fitting weather for the somber surroundings. 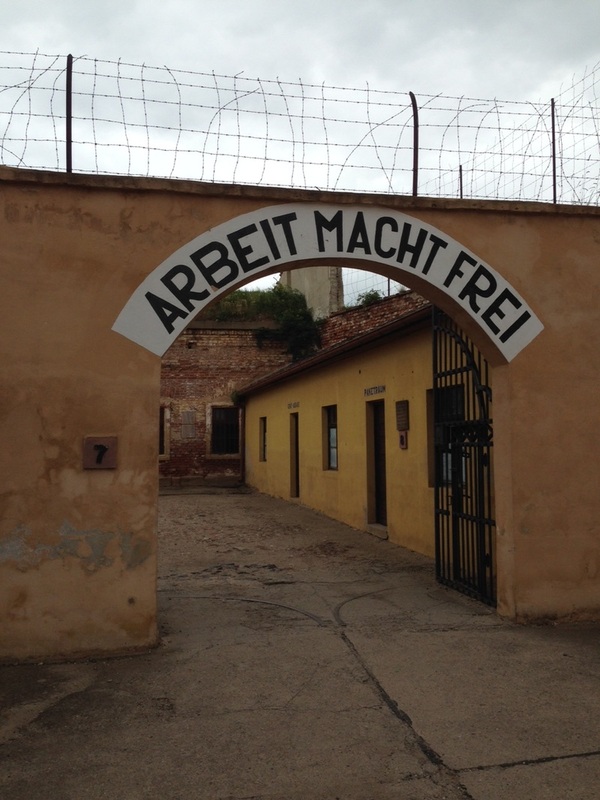 Terezín (known as Theresienstadt in German) was converted to a Jewish ghetto during WWII, and the adjacent fortress was made a Gestapo prison. 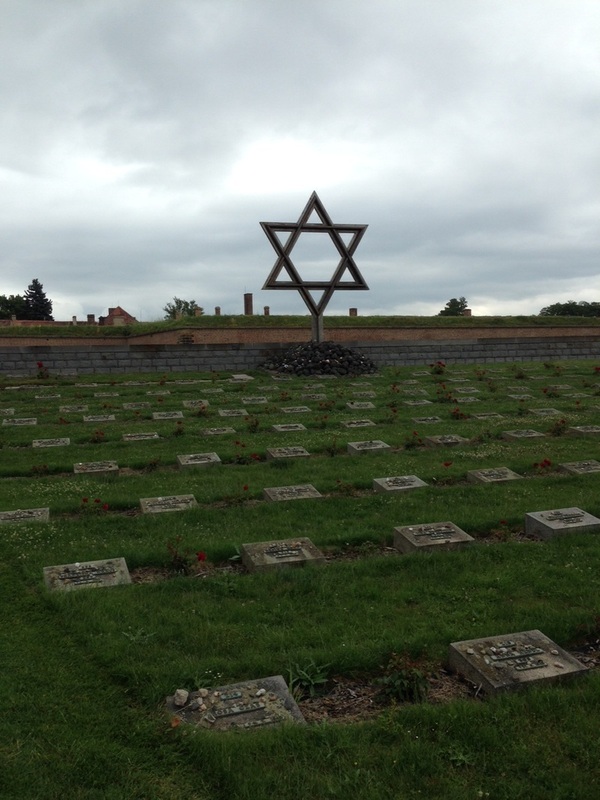 In total, 33,000 people died in Terezín between the years 1941 and 1945. We first visited the "Small Fortress" (Gestapo prison) where prisoners were interrogated, tortured, and killed. The cemetery lies right outside the Small Fortress's walls as well. Then, we turned around and walked into the town, which is itself a fortress. It was used entirely as a place to detain Jews and other political prisoners during the war years, since its original inhabitants were evacuated a few years before the war started. The Terezín Ghetto was notable for being the main repository for most Jewish musicians in the area. 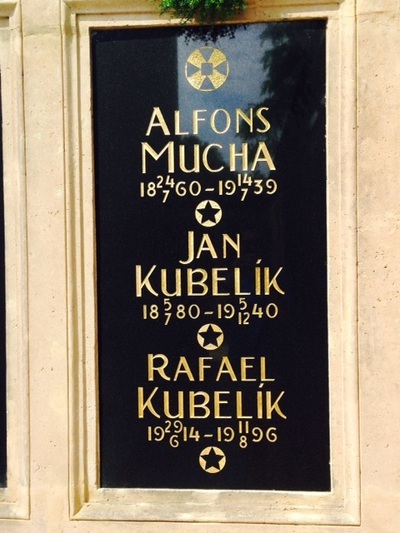 Notable musicians such as Karel Ančerl, Rudolf Karel, Viktor Ullmann, Rafael Schächter, Pavel Haas, Gideon Klein, and Hans Krása, were all kept in the ghetto. Gate inside the Small Fortress with the infamous Nazi slogan "Work Makes One Free"
In town, we visited the Ghetto Museum, which houses many original artifacts from the days of the ghetto's existence (original musical scores, posters, diaries, etc.). Afterwards, we left the town and grabbed a quick lunch before heading back south. 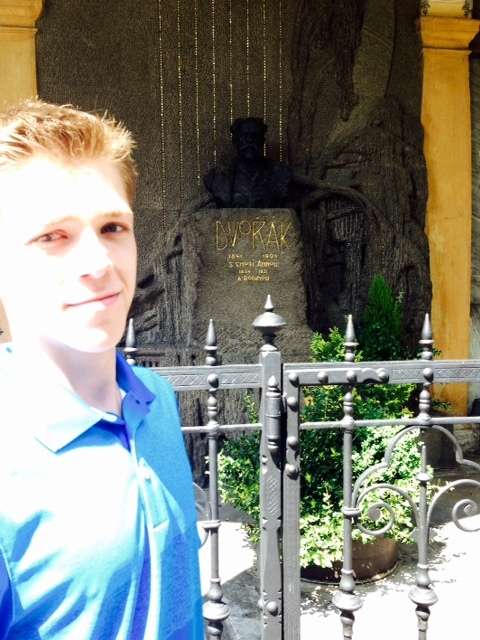 We made a detour on the drive back to Prague to stop at two important sites related to composer Antonín Dvořák. The first place we stopped was the town of Nelahozeves, the composer's birthplace. His father, František, had a butcher shop and tavern right near the town castle, and today the building is a memorial dedicated to Dvořák. After Nelahozeves, we drove to the nearby town of Zlonice, where the composer was educated in music during his early teenage years. From Zlonice, we drove back to Prague and were able to return our car early at around 4:30pm. Then, we walked to dinner at the Municipal House's café, Kavarna. I ordered roast lamb, since my name Beránek literally means "lamb". We grabbed some trdelník (the same place as Day 4) and then walked to Lesser Town to hop a tram to our apartment. We were home by 6:30pm for a change, so hopefully I'll finally get some much needed rest. After checking out of our hotel in Písek this morning around 9:30am, we drove to the nearby town of Strakonice to meet Dr. Cwach again. He took us to the Základní umělecká škola (Intermediate Art School) where we met with a dance teacher named Alice. She showed me all the typical Bohemian folk dances and explained their characteristics to me. She even played different musical examples and also had me play for her a few times. It was very helpful to finally see the music I know/wrote in its proper dance form! Dr. Cwach then took my mom and I to the Strakonice Bagpipe Museum (via an old bookstore to buy even more sheet music) and gave us a tour. Dr. Cwach's knowledge of bagpipes is incredible, and it was a joy to learn more with him. We also climbed the castle tower at the museum and had some nice views of the town. Once we left the museum, we had lunch at Pizzerie U Papeže (the Pope Pizzeria) right across the river and enjoyed spending time with Dr. Cwach. We said goodbye to him after lunch and then drove to the town of Vysoká u Příbramě. Composer Antonín Dvořák's summer home was in Vysoká, and supposedly there was a museum. 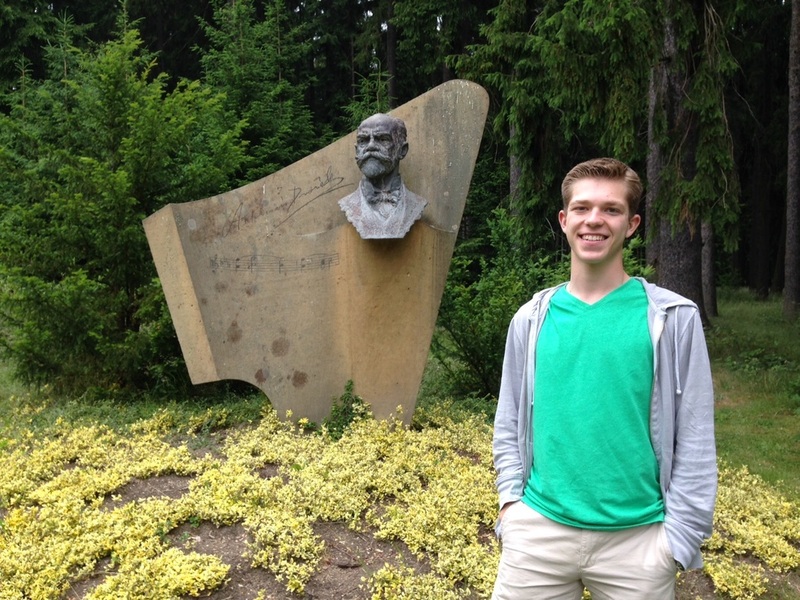 We followed road signs to the "Dvořák památník" (memorial) and, after a long, picturesque walk through the woods, we came upon the memorial and house/museum! 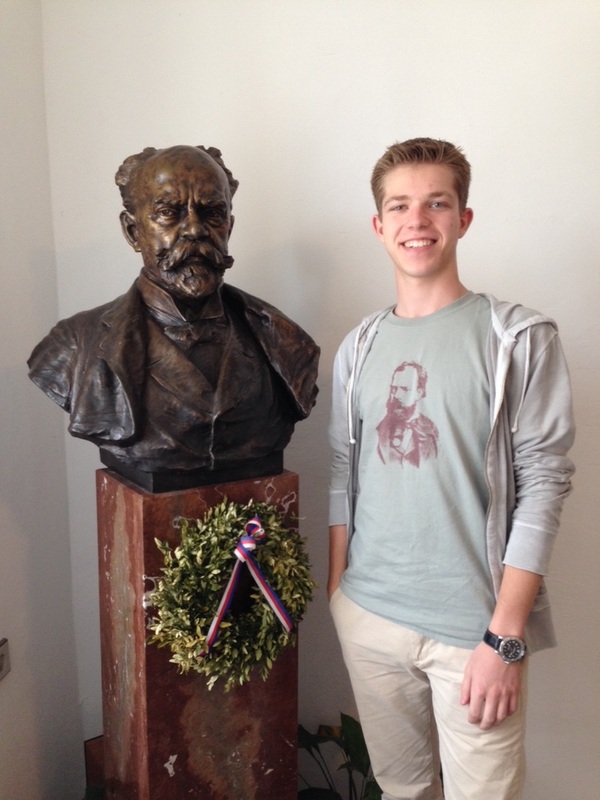 We went inside and watched a movie on Dvořák's life and were able to tour all three levels of the museum. 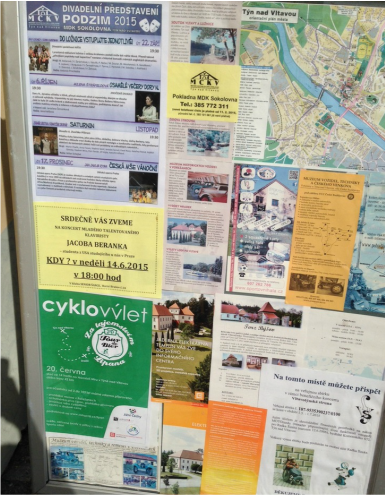 But then, to my disappointment, we found out...the building was actually not Dvořák's house! It was his brother-in-law's residence - Dvořák lived somewhere completely different. I asked the guide at the museum (in broken Czech) where the real Dvořák home was, and she gave me directions and a map, but said it was closed. Nonetheless, I still wanted to see the true Dvořák cottage, so we drove there anyways. The building was surrounded by a huge wall and a locked iron gate. I could see a little inside the wall, and was shocked to see a building in sore need of repair, looking very drab and dilapidated. I noticed a small note on the gate that said something about "brána v Dolní" (a lower gate), so I figured I'd look around for another entrance. Sure enough, there was an even bigger iron gate on the other side, but I figured it, too, would be locked. I checked just for fun...and it opened! We soon found ourselves walking down the small driveway to the Dvořák house, and I noticed a man get up from the front porch and walk towards us. I cautiously greeted him in Czech, and he responded to me, but then just stared at me without speaking. Finally, I said slowly in English, "We just came from the Dvořák památník and..."
"Ah, I see," he said (in English!). "Very well. I am Petr Dvořák. 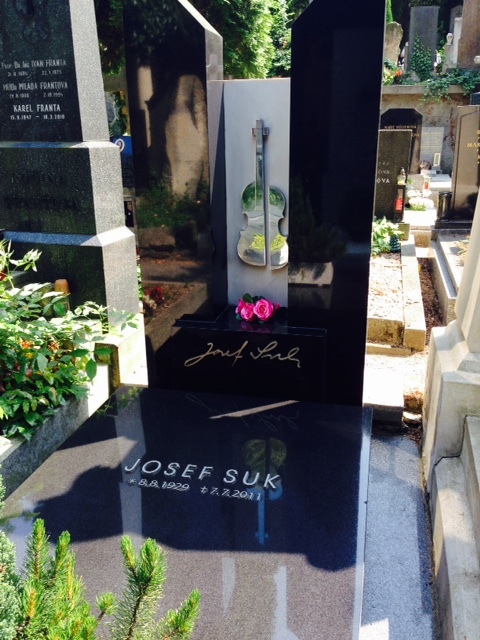 The composer Antonín Dvořák was my great-grandfather." I couldn't believe it! 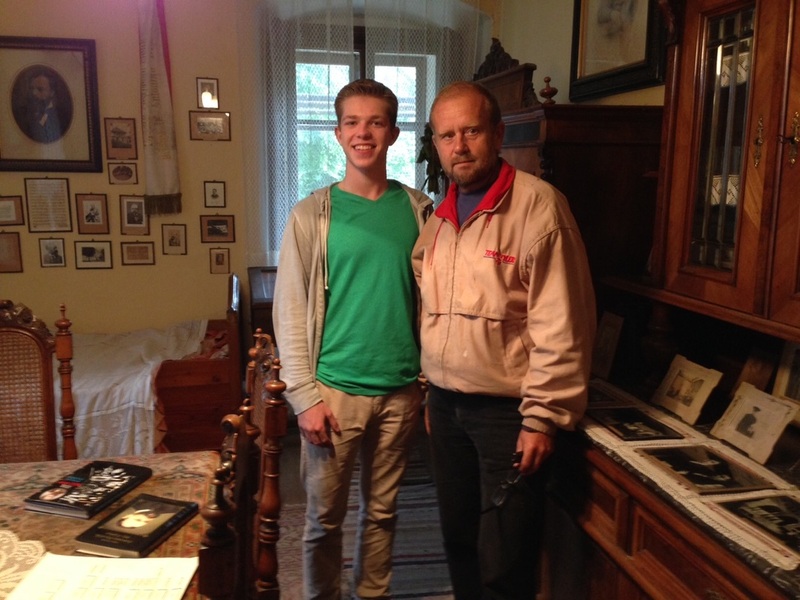 Here, standing before me, was Dvořák's own descendant at Dvořák's own house. I explained to Mr. Dvořák how much I admired his great-grandfather, and that I too was a pianist and composer. 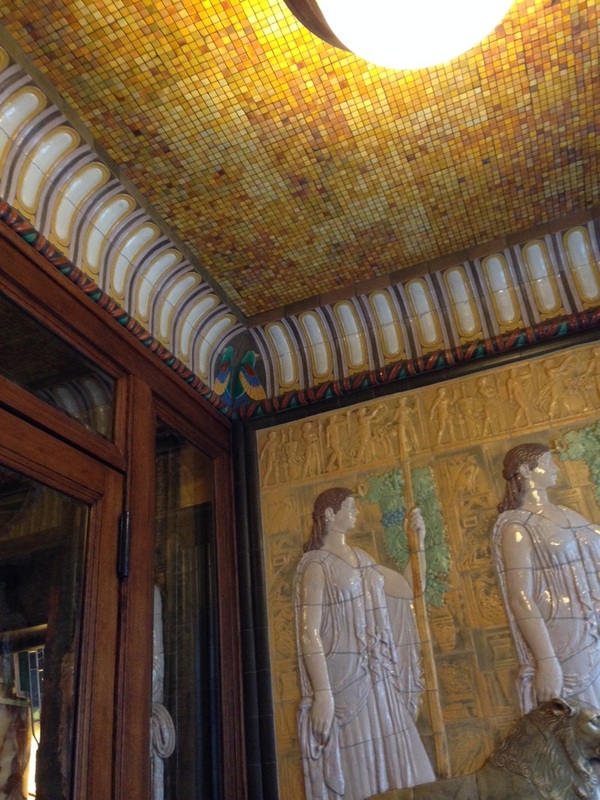 He welcomed us inside the two-hundred-year-old building and gave us a small tour. We saw Dvořák's bed, piano, hats, letters, and even his writing desk...with his own pen! After many pictures and discussions, Mr. Dvořák and I swapped business cards, and we left around 4:30pm. From there, Mom and I drove back to Prague and arrived at our current apartment on Říčanova Street around 6:00pm. After we moved our luggage inside, we hopped a tram and went to the Malostranská area for dinner. We ate at the U Magistra Kelly restaurant again (see Day 6), and we both had goulash and cabbage soup this time. The meal finished up around 9:00, and we caught the tram back to our apartment again. Tomorrow, we plan on road-tripping around Northern Bohemia, and stopping at several more musical locations. After a day like this, who knows who we'll meet! We got up very early this morning and met Mr. Souhrada at 8:00am. 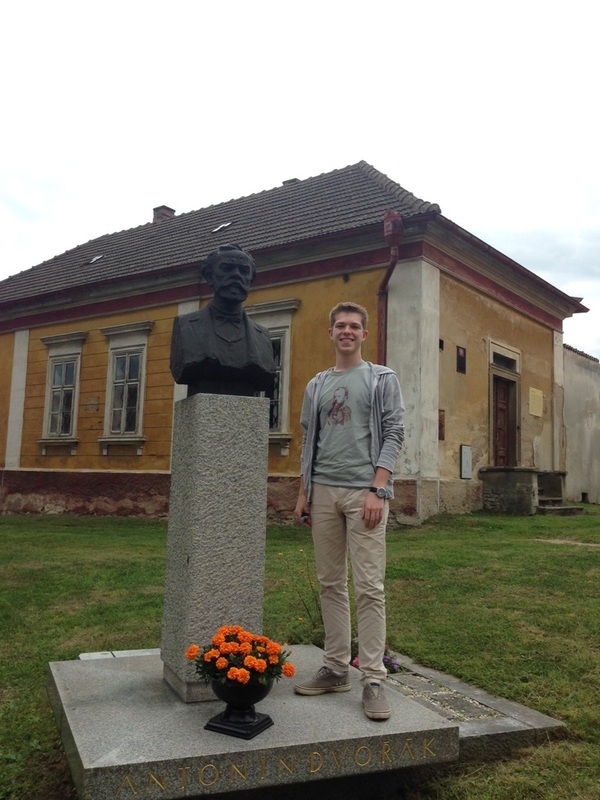 He drove us to the Písek Archives where we began researching the history of the Beránek family. At around 9:30, my fourth cousin, Josef Müller, arrived at the Archives and stayed with us till 11:00. He brought along two extremely large family trees (both dating back to the 1600s) as well as some old photographs and maps - all for me to keep! All in all, in our three hours at the Archives, we were able to learn many new things about my ancestors over the years. After the Archives, we said goodbye to Josef, and Mr. Souhrada took us downtown for lunch. We ate at his friend's restaurant (U Dobré Pohody), and then he showed us around the Church of the Nativity of the Virgin Mary. It was a striking building - nearly 800 years old! Once we left the church, we walked to the "Prácheňské muzeum" in Písek and viewed several exhibits that recounted local history dating back to around 1500 BC. We left the museum around 3:00, and Mr. Souhrada drove us back to our hotel. He promised to keep working on my family tree, even though who knows when we'll see each other again. From there, Mom and I got in the car and started driving around in the forest by our hotel. I knew my ancestors' home U Beránka was located on the other side of the woods, but the question was how to get there. Long story short, we may or may not have traveled on several miles of bike paths and logging trails (of questionable legality) before reemerging on the south side of the woods two miles from our goal. Then, we took a country road back into the woods and finally arrived at U Beránka. A little background on the house: U Beránka, which literally means "At the Beraneks," was built in 1777 by my great(x6)-grandparents, Josef and Alžběta Beránek. It passed through four generations of Beráneks before arriving at my great-great-grandfather, František Beránek. He sold the house in 1891 when he left for America with my great-great-grandmother. Since then, it fell into disrepair, and was going to be demolished in the 1960s. However, a certain Mr. and Mrs. Svoboda (of no relation to our family) demanded the house be saved and bought the place in 1965. Although Mr. Svoboda has since passed away, Mrs. Svoboda still lives there, 50 years later. 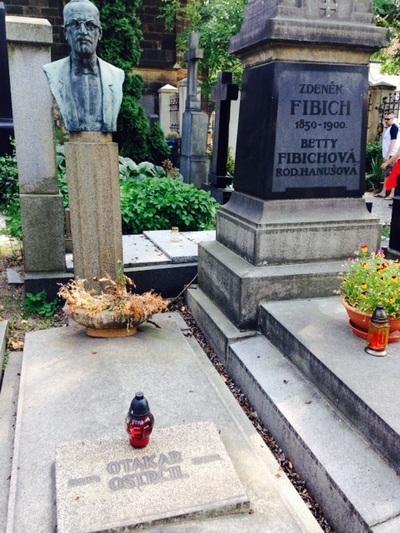 I had been to U Beránka two years ago and was able to meet Mrs. Svoboda then (who was eighty-five years old at the time), but I had a translator with me. This time, we had no translator, and I was debating whether I should try to see her again. To my amazement, when I walked down the driveway, she was standing outside at the front gate cleaning. I kind of startled her, but she immediately recognized me once I explained who I was in broken Czech. She invited my mom and I into the house again and served us coffee out on the front porch. Between my limited knowledge of Czech and my mom's limited knowledge of German, we were able to sit and converse with her for a whole hour! We exchanged addresses, and I left a copy of my composition "Evening Prayers" with Mrs. Svoboda (who is quite the music lover). We said goodbye around 5:30 with many hugs and our promise to keep in touch. The front of "U Beránka"
With Mrs. Svoboda outside of "U Beránka"
After U Beránka, we attempted to leave the woods (also named after the Beráneks), but to our horror, we found that the forest gate had been closed! That is, we were locked in with no easy way out. So, trying to stay calm, we turned around and headed back deeper into the woods on the logging trail hoping to come across a bike path with an open gate. Thankfully, after only a few miles of driving, we found that the Albrechtice gate was still open - so we made it out alive! From there, we drove to the nearby village of Paseky where my great-great-grandma Rose (née Skala) Beránek was born. We revisited her birthplace, which is right along the main road. Then, we traveled through the villages of Žďár and Žďárské Chalupy, and stopped at the cemetery in Myšenec. From there, we turned around and (avoiding the woods this time), made it back to our hotel around 7:00. We went downtown for dinner and had a decent Czech meal right by Palacky Park before walking back to our hotel around 9:30. We are leaving Písek tomorrow and heading back to Prague, so another eventful day on the road is sure to come! After another breakfast downstairs in our hotel, we checked out around 11:00am and started driving to the town of Písek (the region where my ancestors lived). 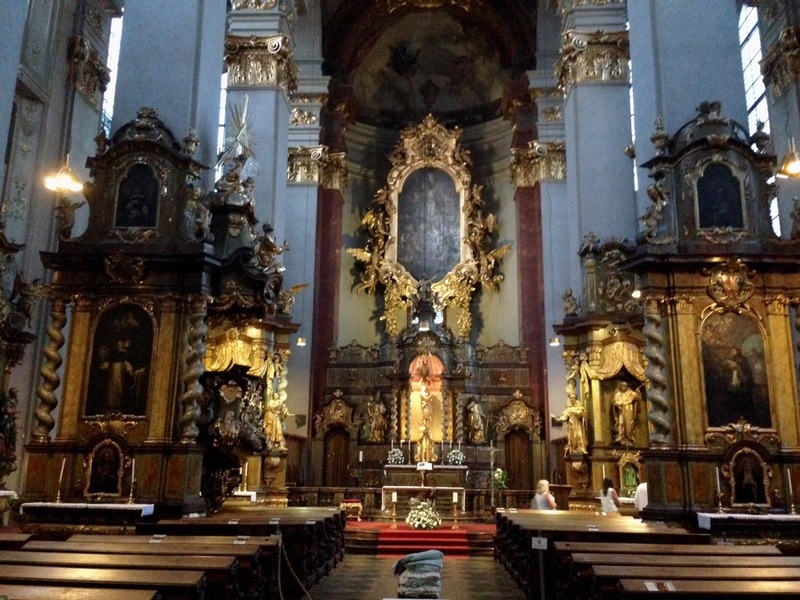 Dr. Mike Cwach had emailed me just before then and asked me to write a brass trio arrangement of the Hussite Hymn "Kdož jsú Boží bojovníci" by Thursday, so I wrote it in the car and had it finished by the time we reached Písek at 1:00pm. We are staying at the Villa Conti, a nice B&B kind of hotel, right on the outskirts of town. 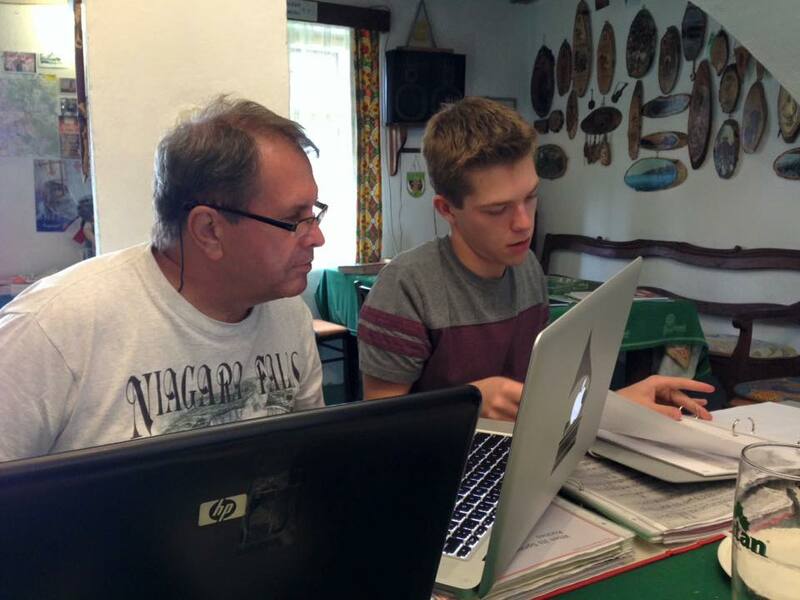 Dr. Cwach showed up at the hotel around 1:00pm and then his friend, genealogist Jiří Souhrada, stopped by around 1:15. Dr. Cwach drove us out to Mr. Souhrada's cottage in the countryside and we all began discussing genealogy. Dr. Cwach casually asked Mr. Souhrada if there was a way to find the names of the owners of buildings in the Czech Republic online. Mr. Souhrada said there was, but it would be easier to call his friend Josef Müller who works in the land records office. So, he called Mr. Müller and asked him for the owner of my ancestor's house (called "U Beránka"). Mr. Müller was startled. "That's my ancestors' house!" 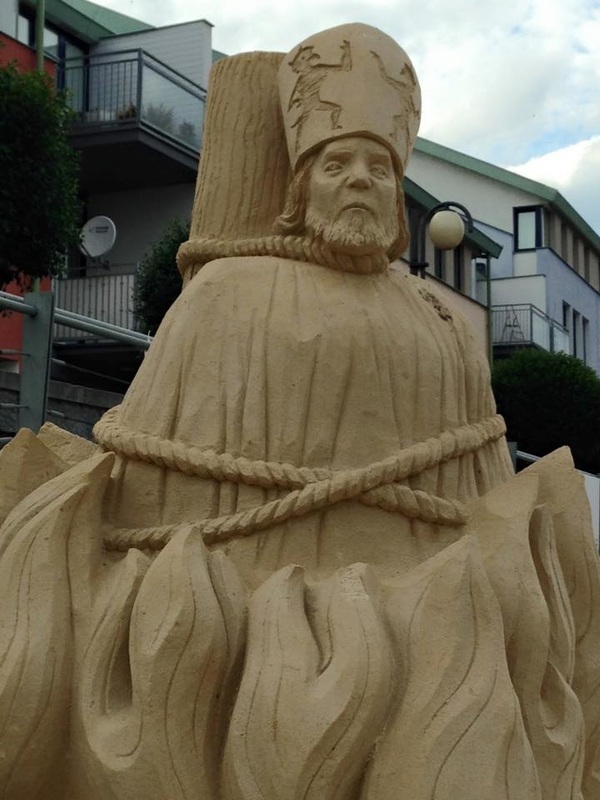 he exclaimed in Czech. It turns out that - miraculously - we stumbled upon a long-lost relative of mine, who just so happens to be a record-keeper and genealogist! We soon learned that Mr. Müller is actually my fourth cousin, as his mom's side of the family are Beráneks! We left Mr. Souhrada's place about 4:00 in the afternoon, and my relative, Mr. Müller, is now planning to meet us at the Archives tomorrow morning, too. Dr. Cwach dropped us off at our hotel, and then Mom and I turned around and walked down to the center of town. At 5 o'clock, the town hall clock rang five times...and then played the Czech tune "Škoda lásky," known in America as "Roll Out the Barrel." Apparently, the town hall announces "happy hour" every day with the chorus of this well-loved drinking song! Seems like something they'd do back home in Wisconsin. After a nice dinner at a pizzeria right on Velké Square, we walked down by the Otava River. 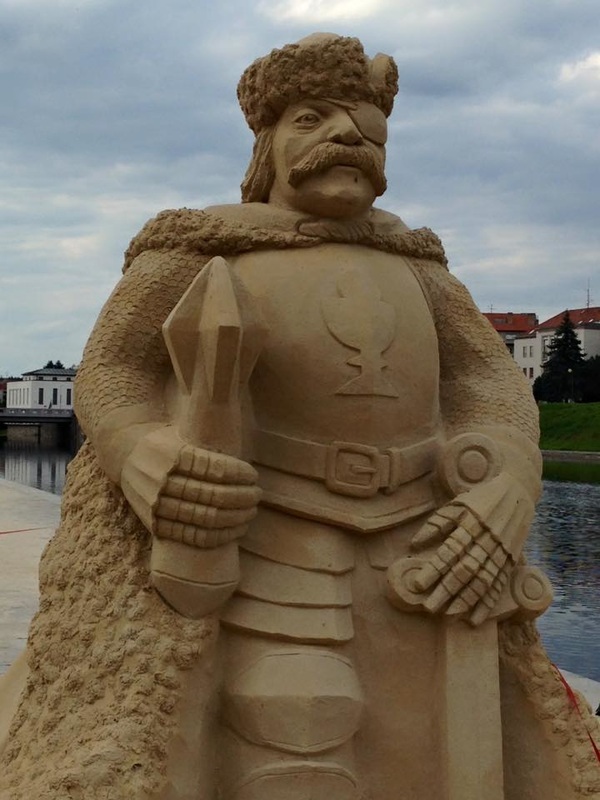 We found some amazing sand sculptures right along the water and learned that sand is actually pretty important to the town (písek literally means "sand"). 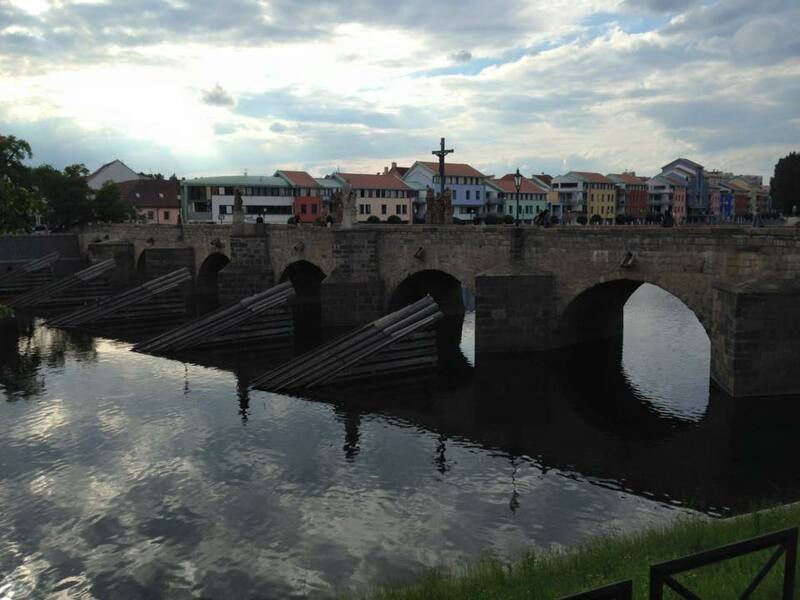 But, the highlight of the evening was crossing the Písek Stone Bridge, the oldest bridge in the Czech Republic. It was built 750 years ago (around the year 1260) and has stood the test of time. After walking back to the hotel, I found that Mr. Müller had sent Mr. Souhrada his family tree. Mr. Souhrada forwarded it to me and I was amazed to find that Mr. Müller had traced our Beránek ancestry back to the 1600s! Now that I have all the info saved, I'm all set to learn even more at the Archives tomorrow. Our first stop after leaving Tábor was the small town of Červená Lhota (červená means "red"). The main attraction of this town is a striking chateau that is situated in the middle of the town's lake. The namesake of the town, this red building is a state historic site and is a well-known landmark to many Czechs. The chateau was also the final residence and death-place of Austrian composer Carl Ditters von Dittersdorf (1739-1799). Our next stop was the neighboring village of Deštná. The town must have held the closest available cemetery to Červená Lhota during the 1790s, as Dittersdorf was buried in the Deštná graveyard. After Deštná, we drove all the way to the capital of South Bohemia, České Budějovice (which translates as "Czech Budweis"). Now, I'm sure you're thinking, 'Budweis, sounds like a beer,' and you would be correct. Except Budweis is not the home of the American Budweiser beer, but rather the Czech Budweiser beer (known as Czechvar in the US). It's a long story as to which brewery is the true Budweiser, but basically, the Czechs started brewing "Budweiser" first and the Anheuser-Busch Company swooped in later, took the name, and has been trying to buy them out ever since. Meanwhile, another Czech Budweiser brewery started up, so you could say there are really three different Budweiser beers. We stopped and had a late lunch at a bakery near the city square and then found the South Bohemian Theatre two blocks away. After exploring the city a little bit, we hopped back in our car and started heading north. We left České Budějovice around 4:00 and drove to a town called Hluboká nad Vltavou (the phrase nad Vltavou just means "on the Vltava River"). This wonderful little town is dominated by two buildings: 1) the Church of St. John of Nepomuk and 2) the Hluboká Castle. 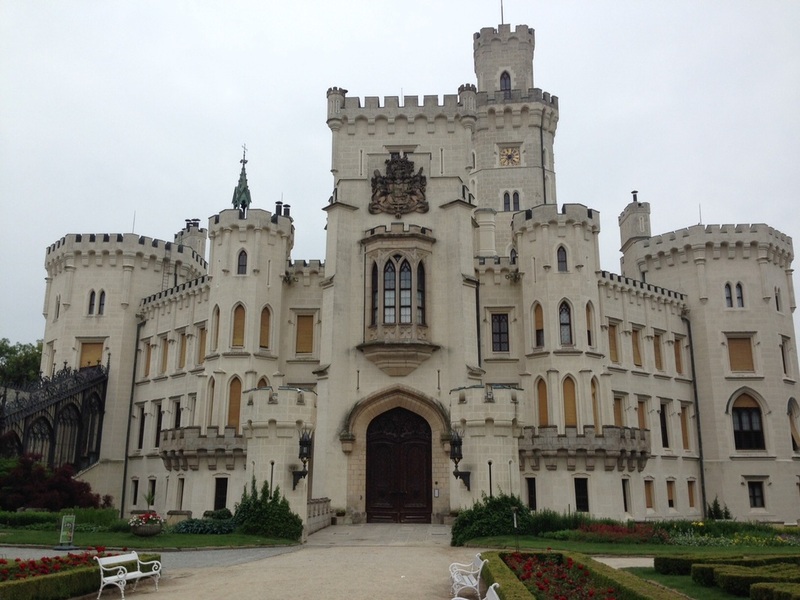 Hluboká Castle, however, is far more impressive than the church. Situated on a hill overlooking the town, the imposing castle was modeled after Windsor Castle in England and is now considered a National Cultural Monument of the Czech Republic. After we left Hluboká, we started driving towards the town of Bechyně. On our way, however, we were met by the grim, foreboding (and frankly, unsettling) Temelín Nucelar Power Station. Its rather extraterrestrial and sinister appearance was only intensified by the dreary weather and the ominous clouds surrounding it. The plant seemed to appear from nowhere, suddenly erupting from the peaceful horizon of the Czech countryside. No wonder it is the source of so much controversy. 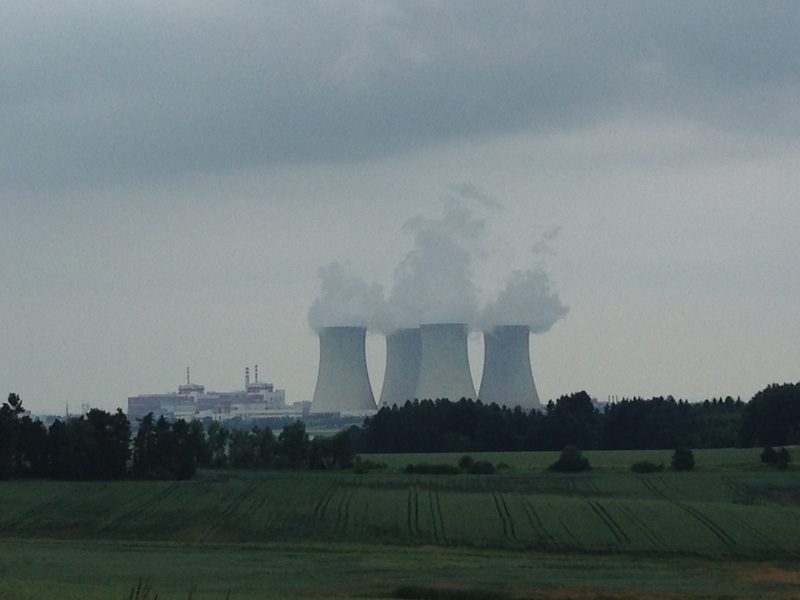 However, we did actually survive our close encounter with the Nuclear Power Plant and made it safely to Bechyně around 6:30 (after missing a few turns several times). 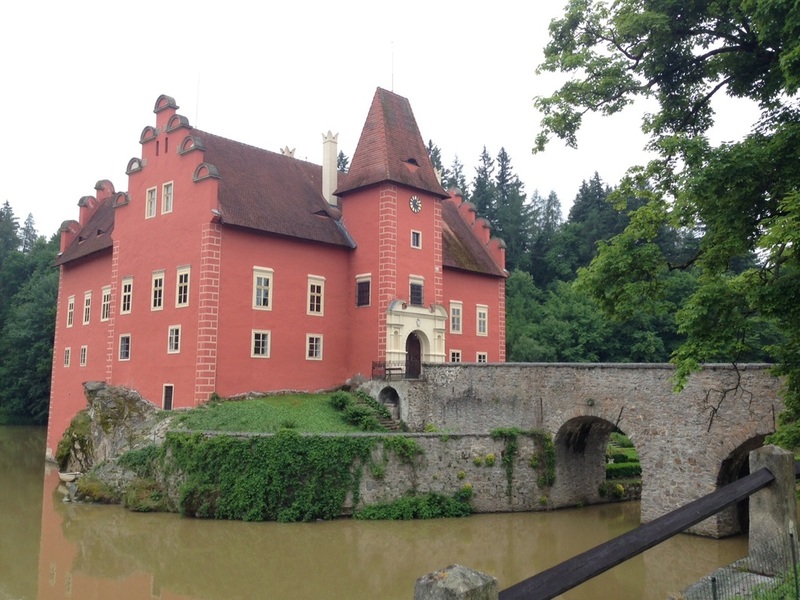 We drove into Bechyně from the southeast and were afforded some great views of Bechyně Castle, another striking building, right on the edge of a rocky precipice. 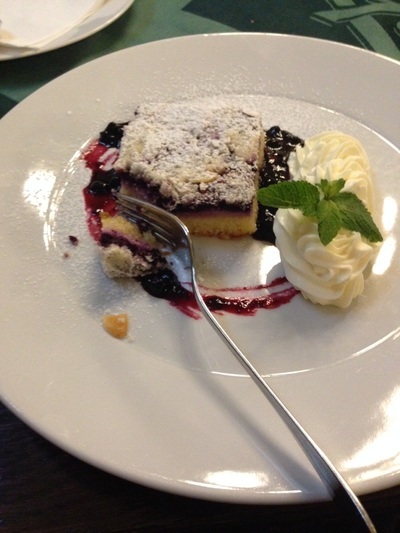 We arrived back in Tábor a little before 7:30 and had dinner in our hotel's restaurant again. We were still pretty full from the Budějovice bakery, so all I could eat was some bread, a bowl of soup, and a salad. Then, we returned to our room and finished editing Dr. Blahunek's presentation on Czech wind band music. 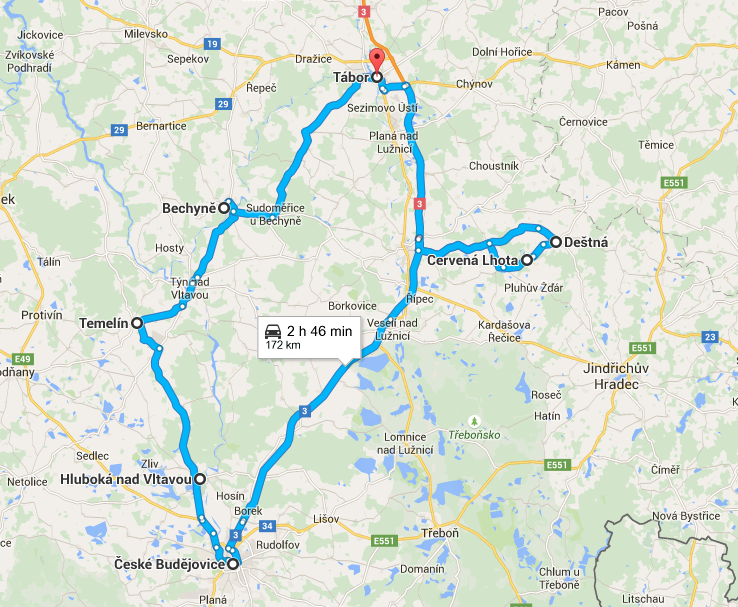 We're checking out tomorrow morning and moving to Písek (near the "ancestral home" of the Beránek family). Hopefully, we'll spend a day full of family history! After a small but good breakfast downstairs in the hotel's restaurant, we walked across the Square to start a walking tour of the city. 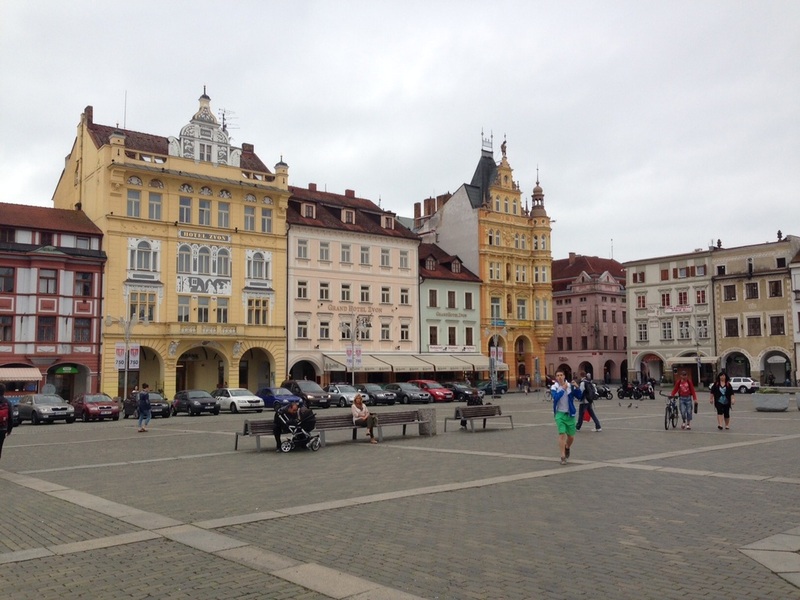 We picked up two free audio guides from the Tábor tourist office and walked around the city for a couple hours. Once our walking tour had finished, we had a small lunch outside our hotel and then got ready to leave for a very busy afternoon. 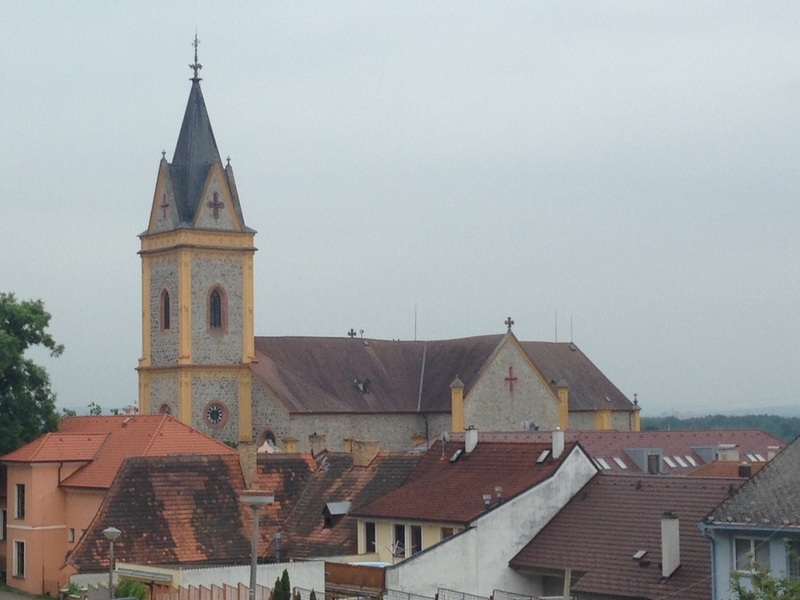 We left Tábor around 2:30 and drove to the nearby town of Bechyně. We met Dr. Mike Cwach, a remarkable Czech-American music historian and bagpiper, in the town square at 3:00. He showed us around the town and pointed out the birthplace of Czech composer Václav Pichl (1741-1805), which is now a restaurant. The birthplace of Pichl, now the "Restaurace U Pichlů"
Then, we left Bechyně and followed Dr. Cwach to his house in Hodonice where I attempted to play his dudy (Bohemian bagpipes). After that, we found the birthplace/death-place of Czech composer and conductor, Karel Komzák I (1823-1893) in Netěchovice, as well as his grave in Týn nad Vltavou. By this time, it was near 5:00, so I changed into more formal clothes and walked to the Catholic charity building in Týn nad Vltavou, where I had a recital scheduled for 6:00pm. Promotional flier, middle left: "We sincerely invite you to the concert of young, talented keyboardist Jacob Beranek." The audience reached about 40 people, anywhere between the ages of 15 and 85. I played a newly refurbished upright piano for nearly an hour and received warm applause from the audience. For my final piece, I premiered the polka that I wrote for Radoslav Kvapil two weeks ago, and, after receiving a standing ovation, I played my version of the 12th Street Rag as an encore. As I said before, the audience was extremely welcoming and receptive to me, and although I could not understand everything they were telling me, I could understand when one woman told me my performance had been "from heaven," and when another told me how handsome I looked! The lady in charge of the performance made us all desserts that were similar to a donut rolled up into the shape of a muffin and stuffed with poppy seeds. Then, she gave me a candle and some chocolate as a gift, and her husband had me autograph my own business card! After the wonderful recital experience in Týn, we drove back to Bechyně where we ate at the restaurant mentioned earlier, the birthplace of Václav Pichl. It was an excellent dinner, and we made it home by 11:00pm. Contrary to today, nothing is planned for tomorrow - we'll see how things go! Today was a mostly simple day, since we stayed at home all morning. After a homemade breakfast in our apartment, Col. Dr. Václav Blahunek stopped by around 10:30am for Mom and I to review his presentation on Czech music history and wind band music. After three hours, we still hadn't finished looking it through since we spent so much time discussing and sharing stories! It was one of the most interesting presentations I've ever seen. Once Dr. Blahunek left (a little after 1:30pm), we left the apartment to run a few errands. We stopped by the Czech Post Office to buy some stamps and mail a letter, and we also picked up some more koruny (Czech currency) from the post's ATM. 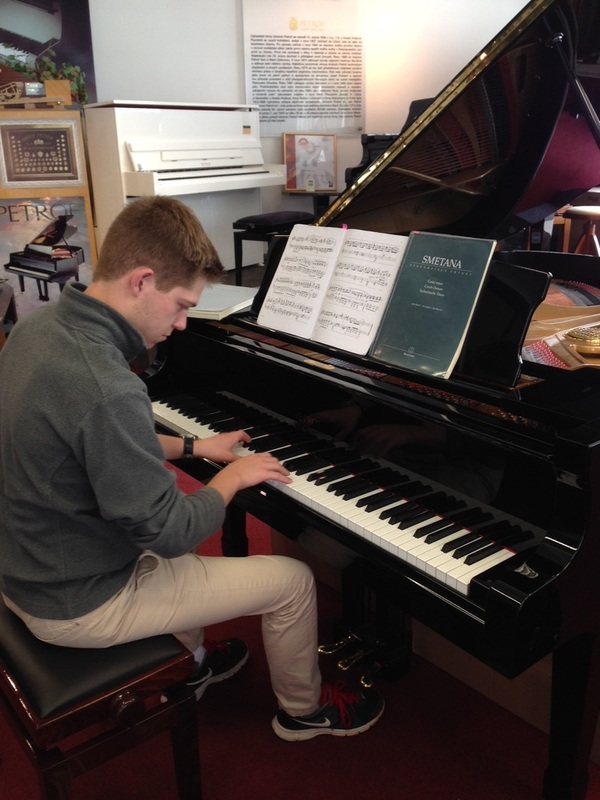 Afterwards, we went to the Petrof Pianosalon in order for me to practice some pieces for my upcoming recital on Sunday. I stayed till 5:30pm, but was interrupted halfway through by a very talented young boy (accompanied by his mother and his teacher) who needed to practice for an upcoming competition. By that time we were pretty hungry, so we had dinner at the nearby Pizzerie Pulcinella, a hidden Italian restaurant with outstanding pizza! Once dinner was finished, we quickly took the tram back to the apartment (via the Beránek Hotel for a few more bottles of their well-named, specialty beer) and changed clothes before turning right around and going back into the midst of the city for a concert. The concert we attended took place at the Kostel sv. 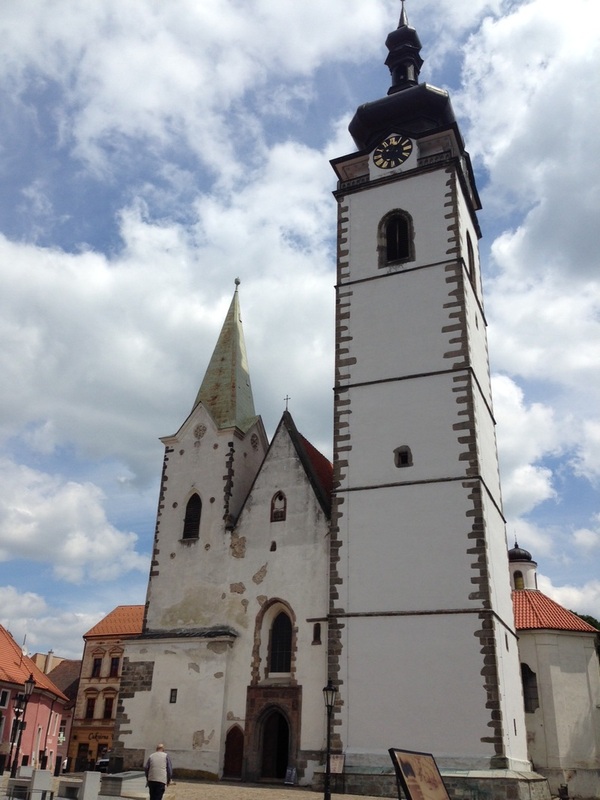 Jiljí (St. Giles's Church), a Baroque-style church whose origins dated back to the 1200's. The church also was featured in a few scenes of the Academy Award-winning film, Amadeus. 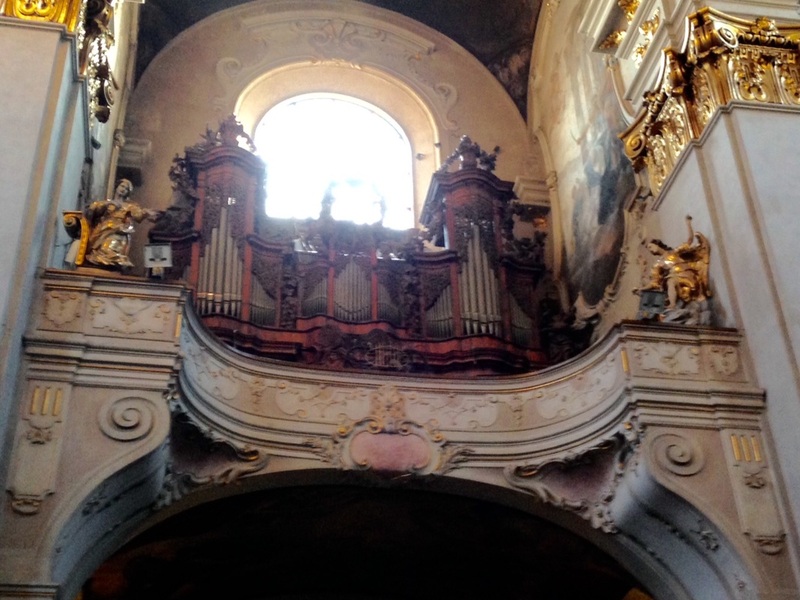 We sat in 400-year-old pews while listening to a marvelous string quartet, as well as the church's magnificent 300-year-old organ of 3500 pipes. The pipe organ of "sv. Jiljí"
After the wonderful concert ended, we walked back to our apartment, via the Angelato gelato cafe near Wenceslaus Square. 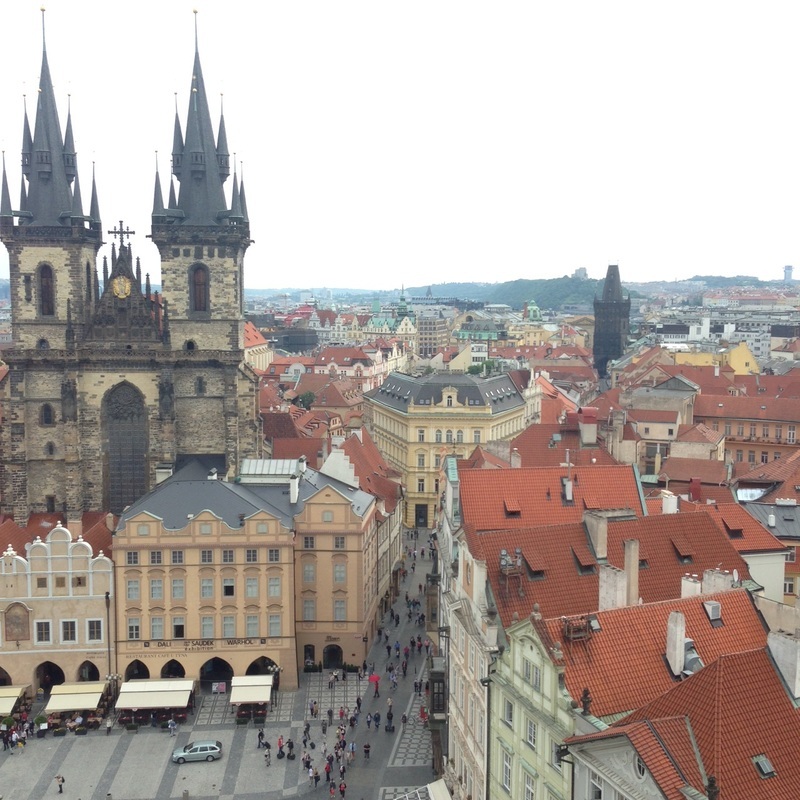 This is the last post from Prague until next week - we're off to South Bohemia tomorrow! The construction workers outside our apartment window were our wake-up call this morning...apparently it's legal to use a jackhammer at 7am in Prague. Once we rolled out of bed, we traveled to Old Town for breakfast at Bakeshop Praha (chocolate croissants, quiche, hot chocolate, and coffee) and then walked around Old Town Square for a bit. 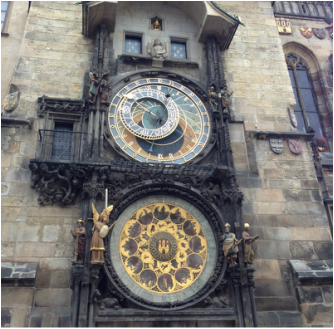 We climbed to the top of the Old Town Hall Tower and also saw the Astronomical Clock strike 11:00. 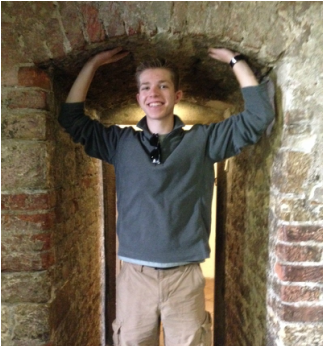 I also took a before-and-after picture in the archway of the Old Town Hall (see the difference?). I had my final lesson with Radoslav Kvapil today at noon. I learned more about his life during the Communist Regime in Czechoslovakia and also gained some insight into lesser known Czech piano works like Zdeněk Fibich's Nálady, dojmy a uponmínky (Moods, Impressions, and Reminiscences) and Antonín Dvořák's Dumka & Furiant, Op. 12. After he gave me a final overview of what to improve on in the future, I played a polka I wrote for him and we concluded by playing Dvořák's Slavonic Dance duets No. 7 and 8 together. I was able to get a picture with him as well. 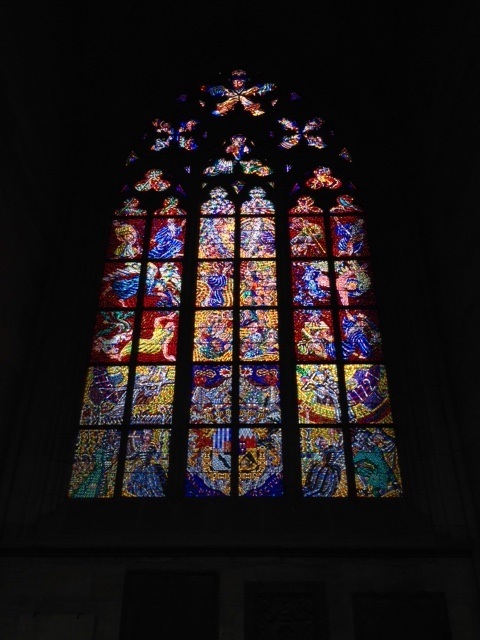 After leaving Mr. Kvapil, we stopped back at the apartment briefly, then left for the Czech Museum of Music. We grabbed two cups of gelato before arriving at the museum, which is housed in an old Baroque church. I enjoyed the museum thoroughly; there are many original scores and countless ancient instruments from Bohemia, too. There was also an old upright left unattended in the main hall (the sanctuary of the old church), so I played Smetana, Beethoven, and improvised a little too. The museum staff were appreciative! 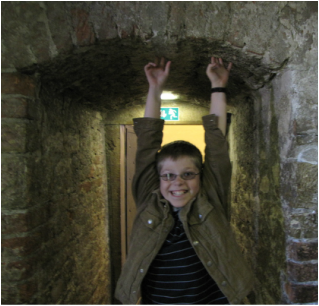 We then walked to St. Nicholas's Church in Lesser Town and climbed the adjacent Town Belfry. Again, the tower provided us with some pretty remarkable views of the city! By that time, it was almost 6:00pm, so we found the "U Magistra Kelly" restaurant nearby for dinner. It was by far the best meal of the trip so far - best goulash of my life, with pork-stuffed potato dumplings that were to die for! The tiny restaurant was a pretty hidden spot, too. After dinner (and once we had stopped for gelato one last time), we hopped the tram back to our apartment. Another long day and a late night! After a small breakfast at our apartment, we left around 8:15 to take the Metro to the northwest side of the river. 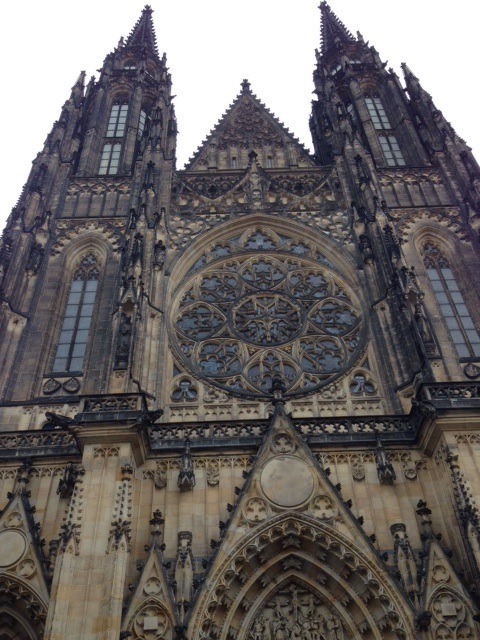 We had been invited by Col. Dr. Václav Blahunek to sit in on his rehearsal of the Prague Castle Guard & Czech Police Band at 9am, but we couldn't find the building where the band rehearsed. We even asked a policeman and he supposedly "did not know." Eventually, we found that it was a huge complex, pretty well hidden from street view. After a police checkpoint and some passport-flashing, we were let in with the help of Col. Blahunek. The rehearsal lasted about an hour, and the band played very well. We were able to hear two pieces by Antonín Dvořák and one by Pyotr Tchaikovsky. After Col. Blahunek's portion of the rehearsal finished, we went back to his office and were able to discuss music (and life in general) for an hour and a half. Once we left the police complex, we headed back to Wenceslaus Square where we stopped at one of the street carts for a couple steaming-hot klobásy (sausages). After that, I took the Metro to Vinohrady for another lesson with Mr. Kvapil. Today we worked solely on the Smetana Obkročák (besides a few scales). Then, we talked for forty minutes about various subjects, including the Communist Regime in Czechoslovakia, the South Bohemian Music Festival, the political problems of Antonín Dvořák, and Vilém Kurz's unfaithful arrangement of Dvořák's Piano Concerto. 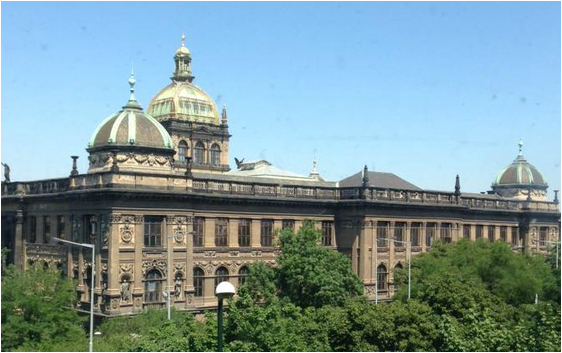 By that time it was after 2:30pm, and I quickly hopped a tram to the other side of Prague to meet with David Talacko (of the well-known sheet music company). Mr. Talacko gave some excellent advice on how to publish and market sheet music and even kept two pieces of mine to look at. I naturally went browsing through his store and found some great scores that will definitely further my knowledge of 20th century European music. After leaving Talacko, I was pretty exhausted, so we headed back to our apartment to drop off the music and turned around to find dinner. We ate right down the road at "Deminka" which smelled like a bowling alley from the 1980s and was just as hazy, yet had very good goulash and strudel. We finished up dinner and decided to just stay home for the night, and maybe catch up on some sleep before another busy day tomorrow. 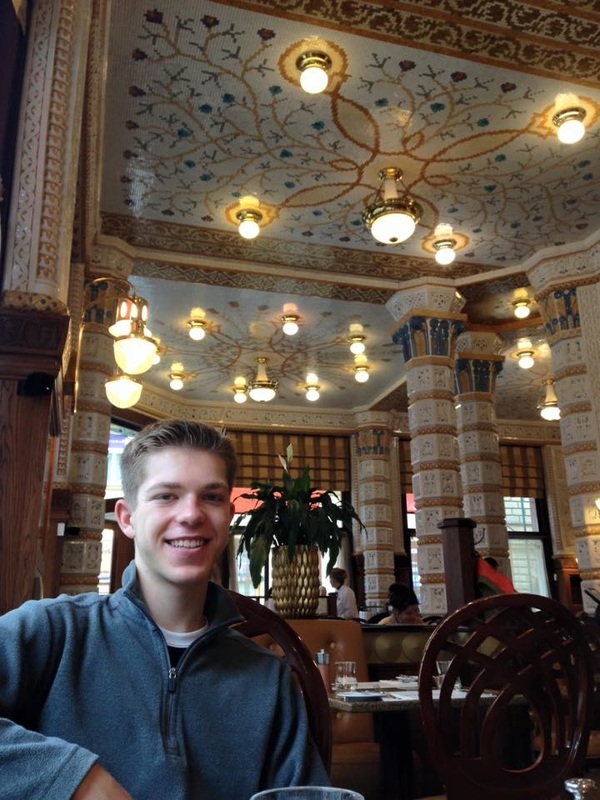 We had a late breakfast this morning at the Café Imperial in Prague 1 - good buffet, but we really go there for interior (completely tiled)! After breakfast, I took the Metro back to Vinohrady and met with Mr. Kvapil a second time. I played a bit of Hindemith's Piano Sonata No. 2, and then we focused on Chopin's Scherzo in B-flat minor. He used the Chopin more as means to explain some technique flaws he observed. We focused largely on relaxation of the arm and the correct ways to strike a key - though it seems basic, it was extremely informative. 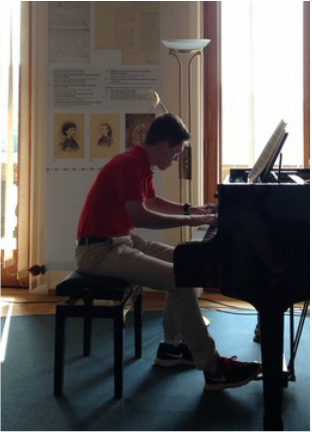 Then we spent some time on the Beethoven Sonata, and I can already see notable improvement. 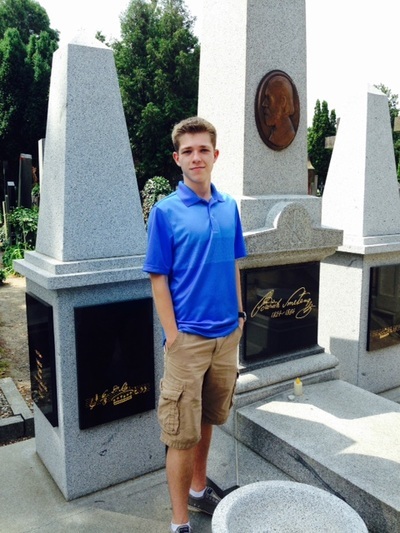 Once the lesson finished at 1:30pm, I met Mom out on the street and we walked around in the Vinohrady Cemetery for a little bit. 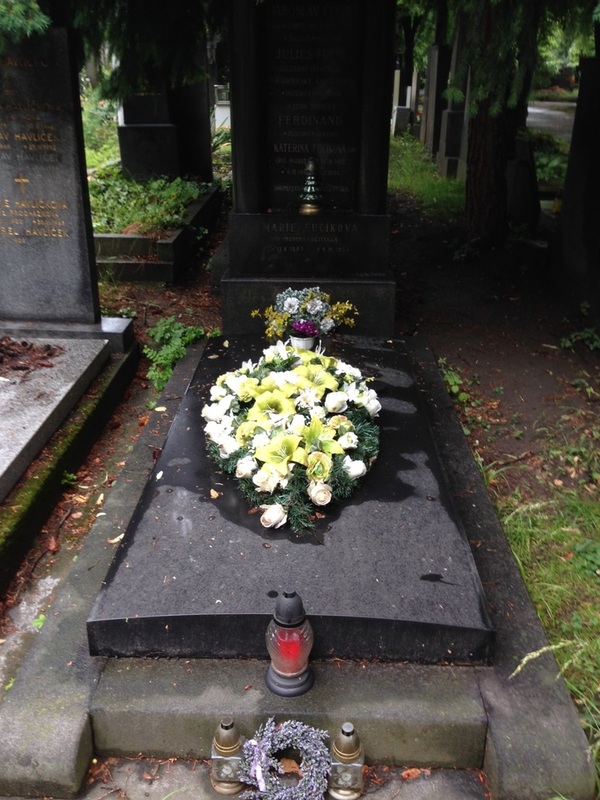 We found the grave of the first president of the Czech Republic, Václav Havel (1936-2011), as well as the grave of Czech composer Julius Fučík (1872-1916). Whether you realize it or not, you have certainly heard at least one Fučík melody (see video below). After the cemetery, we took the tram back through Vinohrady, made a quick stop at the unique Kostel Nejsvětějšího Srdce Páně (The Church of the Most Sacred Heart of Our Lord), and picked up a few groceries (by groceries, I mean two koláče (kolaches), a chocolate muffin, and a bottle of Kofola). 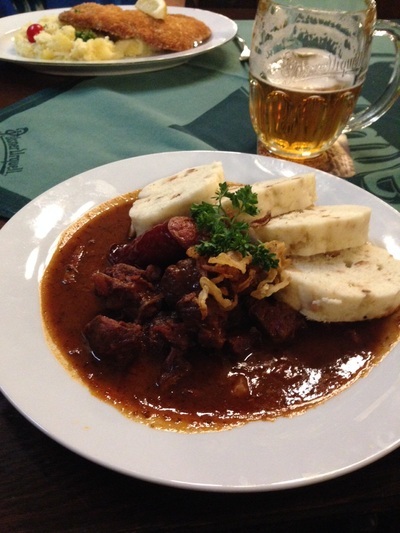 We had an outstanding dinner at the "U Fleků" restaurant downtown - awesome "beer hall" feel (with accordionist), excellent beer cheese, and amazing goulash! They are Prague's oldest brewery (in operation since 1499)! After dinner we took the tram to the Academy of Performing Arts in Prague where I met with the internationally acclaimed Slovak composer Dr. Juraj Filas. The meeting was a wonderful opportunity to discuss composition (and music in general) with such a remarkably welcoming, humble, and brilliant man. We were able to talk about the structure of music schooling in Prague and compositional requirements at the Academy, as well as various ways to develop my compositional style. It was an extremely valuable experience. I encourage any reader to listen to some of Dr. Filas's compositions: look him up on YouTube, iTunes, or find a recording of his Requiem Oratio Spei (it is set to be performed in Carnegie Hall soon). On our walk back home, we stumbled upon some fresh trdelník (a hot Czech pastry rolled in cinnamon sugar) which only made the hike back to the apartment more enjoyable. We left this morning at 9:30 to take a tram to the Vinohrady neighborhood. 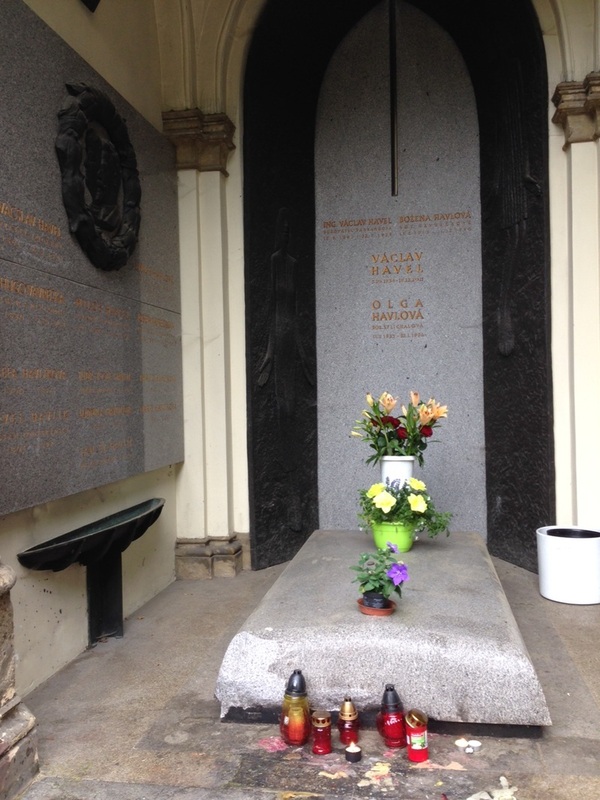 After finding the grave of Czech composer Vilém Blodek (1834-1874) in the Olšany Cemetery, we arrived at the apartment of world-renowned Czech pianist Radoslav Kvapil. It was the first of four lessons I will be taking with him this week. I played the third movement of Beethoven's Piano Sonata No. 5, Kent Kennan's Prelude No. 3, and Smetana's Obkročák from the Czech Dances. Mr. Kvapil is extremely knowledgeable and has taught me how to improve in several areas already. Since Mr. Kvapil suggested I practice a little before our next lesson (tomorrow at noon), I stopped by the Petrof Pianosalon in downtown Prague, where they graciously offered me their showroom to practice for two hours straight. 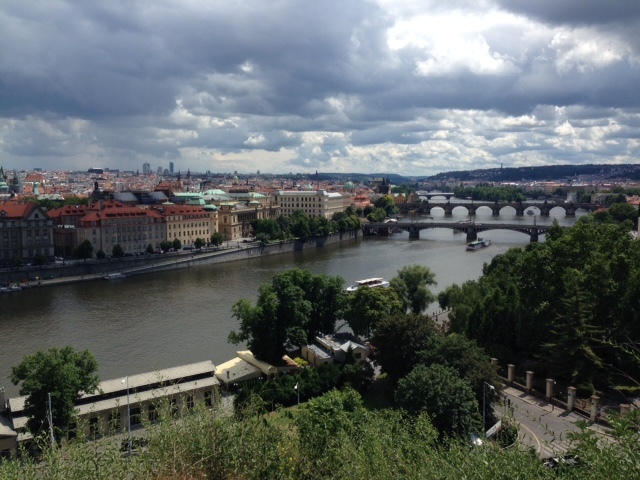 Afterwards, we headed to the Smetana Museum right on the Vltava River. Fortunately for me, one of the guides at the museum was impressed with my feeble attempt at speaking Czech - "Jsem Jakub Beránek. Jsem pianista a hudební skladatel" (that is, "I'm Jacob Beranek. I am a pianist and composer"). She enthusiastically opened up the grand piano in the museum and encouraged me to play. Naturally, I gave in, and performed Smetana's Salon Polka in E major, Poetic Polka in G minor, Obkročák from the Czech Dances, as well as a polka I composed a few days ago. 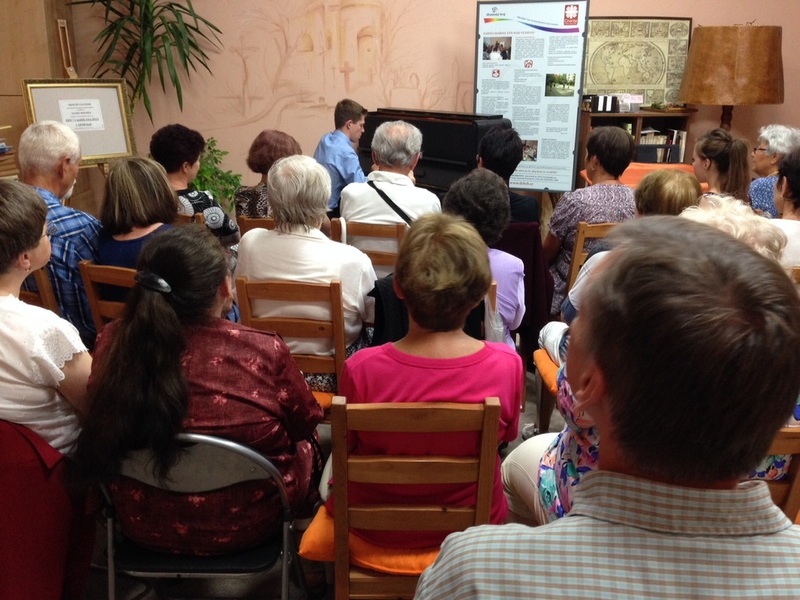 The museum guides and visitors alike seemed to enjoy the small recital thoroughly! After the Smetana Museum closed, we took the tram out to the Vyšehrad neighborhood for an excellent authentic Czech meal at a restaurant called "U Kroka". The pečená kachna s červeným zelím a knedlíkem (traditional Czech roast duck with red cabbage and dumplings), some fantastic potato soup, a mug of Kofola, and "Misa" cake, were the best meal of the trip so far for me. We finished off our night with a nice after-dinner walk along the Vltava River and got a picture by the Dvořák statue outside of the Rudolfinium. Now we are back at our apartment and are about to leave for a dinner and concert at the Prague Municipal House. Looking forward to some Smetana, Dvořák, and Grieg with a traditional Czech meal! Back from the concert (excellent string orchestra in a smaller recital room), thought I'd just share two photos...if this isn't a Czech meal, I don't know what is! After an 8 hour flight from New York, we arrived in Prague this morning. We are staying in a beautiful apartment right near the National Museum (check out the view!). 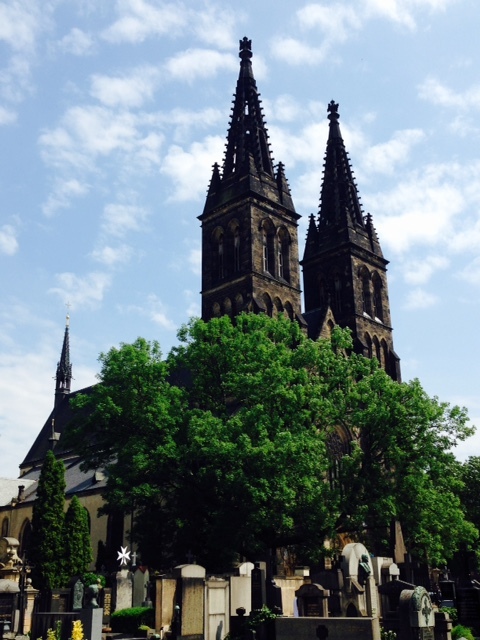 Once we had stocked up on groceries, Mom and I hit the streets to find Bethlehem Chapel, the famous church of Czech Protestant reformer Jan Hus (1371-1415). Beforehand, we grabbed lunch at "U červené židle" (The Red Chair) Choco Cafe, and I was able to enjoy the Czech cola "Kofola"! 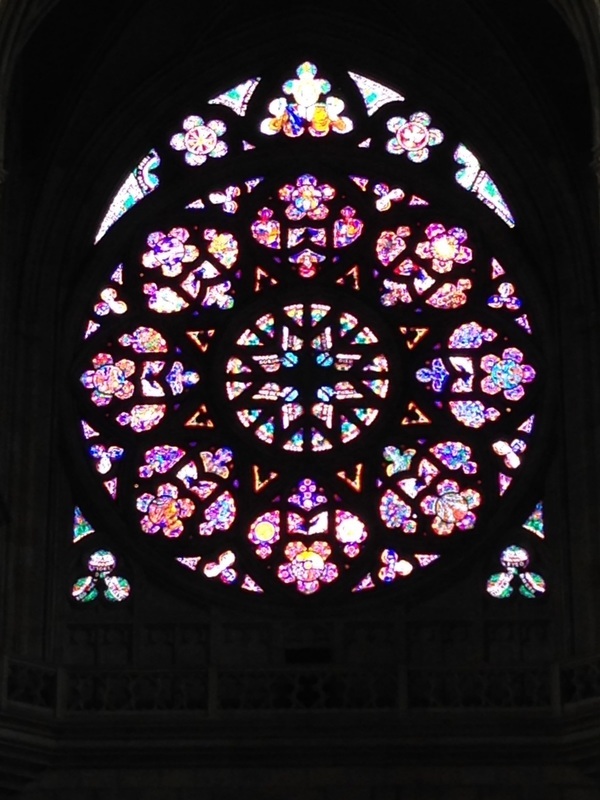 We then toured Bethlehem Chapel and were able to relive a lot of Czech history in an important (and controversial) building. Afterwards, we planned on heading straight back to our apartment, but ended up making two stops along the way. First, we stumbled upon an old sheet music shop right in Wenceslaus Square and bought several scores published during the Communist era. Then, we stopped by the Hotel Beránek to get a few "Beránek Beers". Finding old sheet music in Prague! But now, I hope to catch up on some sleep. Ahoj! Hello everyone! Just wanted to post a quick outline of the trip before we head out this morning. We'll be landing in Prague tomorrow morning, and we'll stay in an apartment for a week. 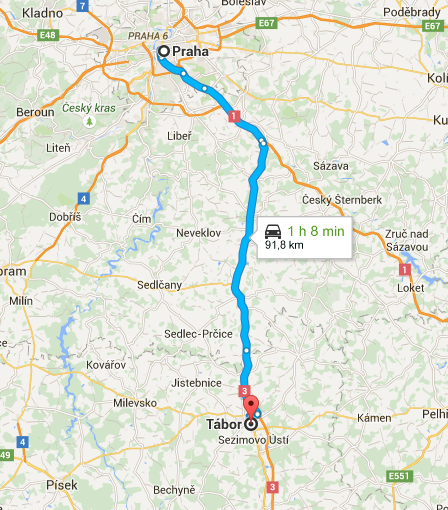 Then, we're going to drive to the city of Tábor and stay there a few days. 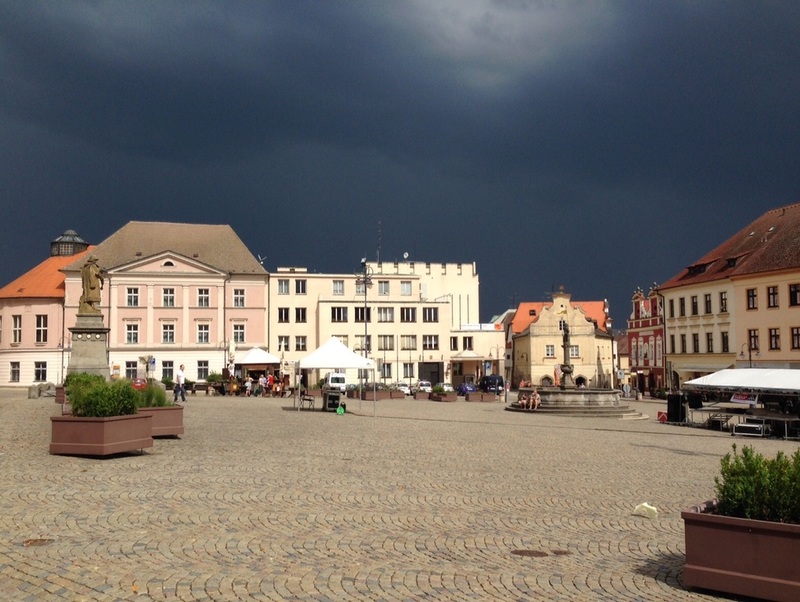 After that, we will stay in the town of Písek for a few nights before returning to Prague. We fly home on June 21. Looking forward to all the amazing musical opportunities to come. Keep us in your thoughts and prayers!